The first monitor based on Nvidia's BFGD will hit the shelves for $5,000. Just stare in awe at this massive BFGD—and no, the “F” doesn’t mean what you think it does. HP just became the first manufacturer to embrace Nvidia’s wild Big Format Gaming Displays in the form of the HP Omen X Emperium 65. This is an insane monitor, full stop. 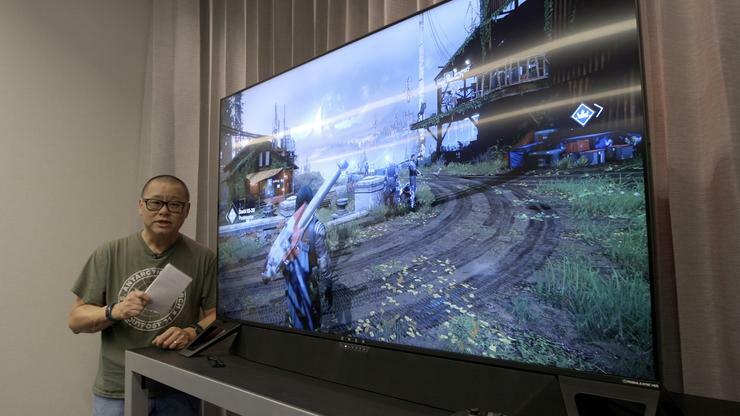 It features a 65-inch 4K HDR display with 384 backlighting zones, DCI-P3 color gamut, game-smoothing G-Sync technology, and a blazing-fast 144Hz refresh rate. It also comes with an Nvidia Shield console built-in, and that massive screen sits on top of a 120 watt soundbar that has been specifically tuned to avoid ripping your monitor apart when things get loud. The soundbar can even detect and amplify footsteps and other in-game sounds if someone’s trying to creep up on you in Fortnite, Overwatch, or any other game. And that’s just the tip of the iceberg for this seriously swanky screen. Be sure to watch the video above for the full details. The Omen Emperium X 65 is expected to roll out in February with an MSRP of $5,000.